If the item is in stock in our store, it will say 'on our shelves now'. If it is not in the store but available, it will say 'usually ships in 1-5 days'. Please let us know if you need it quickly. If the item is designated "special order," it may be out of print and unavailable. We will advise. "There is a difference between remembrance of history and reverence for it." When Mitch Landrieu addressed the people of New Orleans in May 2017 about his decision to take down four Confederate monuments, including the statue of Robert E. Lee, he struck a nerve nationally, and his speech has now been heard or seen by millions across the country. 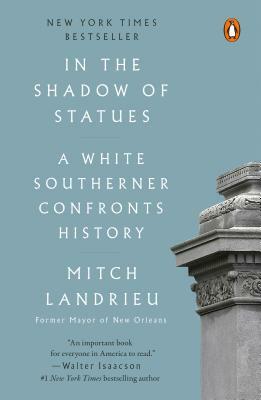 In his first book, Mayor Landrieu discusses his personal journey on race as well as the path he took to making the decision to remove the monuments, tackles the broader history of slavery, race and institutional inequities that still bedevil America, and traces his personal relationship to this history. His father, as state legislator and mayor, was a huge force in the integration of New Orleans in the 1960s and 19070s. Landrieu grew up with a progressive education in one of the nation's most racially divided cities, but even he had to relearn Southern history as it really happened. Equal parts unblinking memoir, history, and prescription for finally confronting America's most painful legacy, In the Shadow of Statues contributes strongly to the national conversation about race in the age of Donald Trump, at a time when racism is resurgent with seemingly tacit approval from the highest levels of government and when too many Americans have a misplaced nostalgia for a time and place that never existed. Mitch Landrieu is the mayor of New Orleans. He was elected in 2010 and is now completing his second four-year term. A Democrat, Landrieu served as lieutenant governor of Louisiana from 2004 to 2010. He is also president of the U.S. Conference of Mayors. His father, Moon Landrieu, was mayor of New Orleans from 1970 to 1978 and a leading civil rights pioneer. Featured in Newsweek's "50 Coolest Books to Read This Summer"
Included in Esquire's "Best Nonfiction Books of 2018"